And then I read both Robin's summer project and this article which makes me a little sad but also gave me an idea. I think it would be fun to write blog posts (so shorter than an Oxford entrance essay!) that have to be spun out from just a one-word prompt. That means I need a bunch of prompts, though...so...what word suggestions do y'all have? In the beginning when God created the heavens and the earth, the Spirit of God hovered over the face of the deep. God’s Spirit of wisdom danced before the Creator at the beginning of time, making delight the first emotion this world knew. The Spirit of God hovered over the waters again at Jesus’ baptism…and again at every baptism celebrated, as we claim God’s grace is for all—as many as the Lord our God shall call. And now the Spirit dances again, this time in tongues of fire and wisps of wind, inviting us all to dance along—out of the safe spaces, the sanctuaries, and into the streets where people long to hear good news of hope, to see what peace and justice and community look like, to feel God’s breath rushing through the streets and commanding our attention. On that first Pentecost, the disciples weren’t sure what to do next—they only knew that they needed to stay inside, where it was safe. On this Pentecost, we seem to think we have everything figured out, and if we just stick to the plan and follow the bulletin, then everything will be safe. But the Spirit of God has other ideas. You see, God has called a people to be the Church—to be the Body of Christ, to love and live and serve as Jesus’ hands and feet, to reflect God’s glory, to BE the people of God right here, right now, whether it’s safe or not. Sometimes we seem to think that the Church is a building—a place where we go. Sometimes we seem to think that Church is something we do—we show up and say the right words and then we’re done. Sometimes we seem to think that the Church is an institution that exists serve us—like a vending machine giving us whatever programs, kind words, and comfort we might need…but never offering words of challenge to us, our beliefs, or the way the world works. Sometimes we think the Church is just another social club or just another non-profit agency—we join the group and give a little money to the cause and forget about it until the next mailing comes. But none of these things are the Church. The Body of Christ isn’t an institution, isn’t a cause you join, isn’t a vending machine, isn’t a few magic words a week. The Church is US. A living, breathing, ever-changing organism made up of US. And the Body of Christ has a mission—it’s God’s mission, and we have the privilege of participating in it. That mission is pretty simple, really: Do Justice. Practice Compassion. Walk Humbly With God. Love your neighbor as yourself. That’s it—love. justice. compassion. humility. 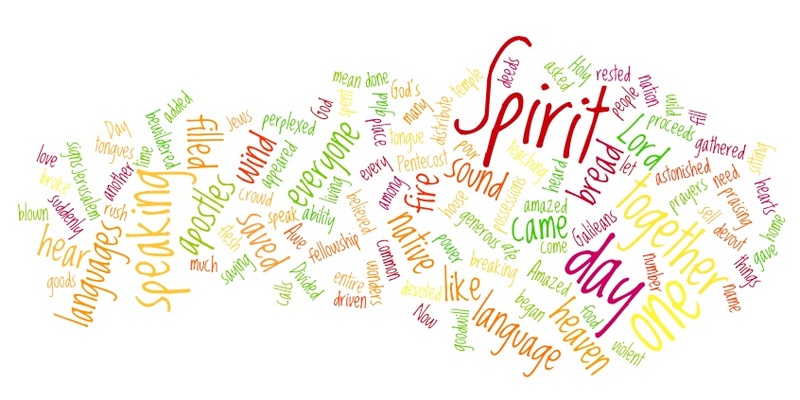 That is what the Spirit blows into our lives to give us, and to call us to do and be. This morning several of our youth—people who have been nurtured by many of you, who have taught Sunday School, helped with confirmation class, offered encouraging smiles, led youth group, shared conversations at potlucks, served in mission, and prayed for them—these youth will stand before this congregation, this part of the Body of Christ. Together we will remember the promises we made at their and so many other baptisms—promises to nurture and guide, through word and deed. We will remember God’s promise of grace and gift of community. And we will look for little tongues of fire—another kind of baptism, this one a calling to join in this mission God has set forth, to do our best to live into the vision of God’s kingdom. This calling will take us out of the sanctuary. It will take us out of our safe places, and the wildfire of God’s love will jump the barriers we have set up, and our task will be to fan the flames. The Spirit is moving, dancing, blowing, and calling us to be The Church—the church that offers challenge alongside comfort, the church that serves rather than being served, the church that gives generously and loves generously and lives generously, the church that is the Body of Christ rather than just an institution, the Church that is gathered in order to be sent out. In Jewish tradition, the festival of Pentecost commemorates God’s giving of the Torah—the law, especially the ten commandments—to Moses on Mount Sinai. The festival isn’t about receiving the Torah—it’s about God giving it—because while the gift happened at a specific point in time, the receiving of that gift takes a lifetime. The gift of the Holy Spirit is the same. On Pentecost God sent the Holy Spirit to the church—a Spirit who had been living and breathing through all of creation and throughout all our stories, but now has a particular role enlivening the Body of Christ. But our receiving of the Spirit and her gifts, our living into that calling, our process of being filled and refilled to overflowing—that takes a lifetime. And that is what the church is for—to be filled with the Holy Spirit so we can let Life Abundant spill out into the world. As new people join this dance, as the gifts within the body grow and change, as the body lives and moves and breathes and works, we continue the lifelong process of receiving God’s Spirit. The Holy Spirit is at work, even now, even here, calling us to be the Body of Christ. Will we go out and live the good news? Acts 2... make your own at wordle.net. Have you ever wondered if the church IS the "second coming"? The Body of Christ, sent out into the world to help usher in the kingdom of God? 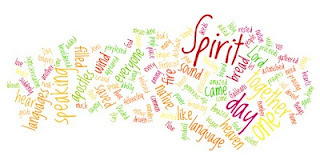 Empowered by the Holy Spirit, the very breath of God that animates all things? So Pentecost is the beginning of this "coming again"...and we're still busy looking into the sky like on Ascension Day rather than seeing Christ all around us? It's kind of interesting to think about, don't you think? The 30 Hour Famine is underway! No more eating until dinner tomorrow night. We have a busy weekend planned even as we're fasting--we'll be learning about homelessness, working at the Food Pantry, going Cosmic Bowling (no snacks! ), clearing out a vacant house and donating what we can to a local non-profit thrift store, and searching for donations for the food pantry. We'll also watch Food Inc and worship and study the Bible and pray...it's a busy weekend! Once that's over...time to write a sermon. Sunday we have worship at 830 as normal, but at 930 and 11 the youth will lead worship and present selections from Godspell--awesome! Then a fabulous potluck (what am I going to bring???) and the Youth Auction (live! a live auction is a fun new twist on the service auction this year)...and then in the afternoon the confirmation class will meet with the session! I hope you have a good day wherever you are now. If only the rest of my life were sunny too. 3. people who cheat on their families. 4. dirty dishes that for some reason don't wash themselves. 6. suicide, whether on purpose or accidental through thrill seeking. 8. carpet that reveals just how much cat hair is on the floor. 10. children dying of hunger. I think that's a pretty good list for God to start with. There may be more lists to come, who knows. Once God gets started on this one we can work on the next one.